Ceptah Bridge helps thousands of Agile and Waterfall teams around the world connect MS Project to JIRA. On the surface, JIRA and Microsoft Project seem to be similar as far as tasks and issues are concerned. But if you dig deeper, there are endless little things that make integrating them in the context of a real-life business process quite tricky. Over the years, we analysed our customer’s feedback and created a product that can reconcile all these differences so that you can get the best of both worlds without entering any information twice, whatever your size, industry, methodology or goals might be. Take your project management to the next level by making Microsoft Project and JIRA work together. 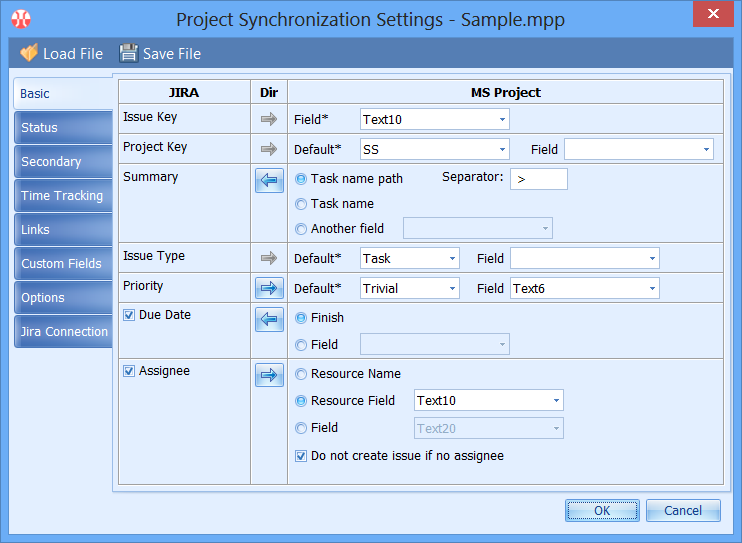 JIRA MS Project Synchronisation will allow you to leverage each system for what it is good at - MS Project for planning, structuring activities, scheduling and keeping everything under control and JIRA for working on tasks, collaboration and reporting progress. Ceptah Brdige, thanks to its extensive set of supported fields and features, will synchronise data between the systems eliminating any manual work, so that you can focus on getting things done. Import your project plan to JIRA and make it available to the team. Then update and re-schedule tasks as the team works on the issues and reports progress. This is just one of the examples of how our product can help you with making the two systems work together at almost no additional effort. Flexible mappings and extensive JIRA fields support, including JIRA Agile features, issue links and Tempo plug-in fields. Import from JIRA to MS Project, issue creation and bi-directional synchronisation. 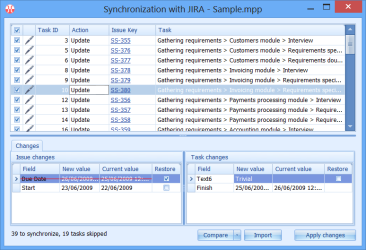 Additional extensibility by running VBA macros at different stages of synchronisation. Can work in command-line mode. JIRA Cloud and all versions of self-hosted JIRA starting from JIRA 5, including JIRA 7. Microsoft Project - all versions from 2000 to 2016. Works with projects stored locally, in MS Project Server or Microsoft Project Online. Ceptah Bridge helps our customers in different ways. Below are some typical use cases. 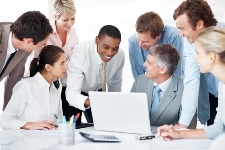 PROBLEM: The manager's tool of choice is Microsoft Project. Needless to say why. Everybody is happy with JIRA, but when it comes to understanding the WBS, scheduling and reporting, things get complicated. SOLUTION: To make life simple again, they introduce Ceptah Bridge. Manager creates a new project plan and pushes it to JIRA. Team members receive their assignments and split them into sub-tasks, as they see fit. They also enter their time estimates. Then the manager imports the new sub-tasks and estimates from JIRA, which adds another level to the project structure, and schedules the activities. After that the systems get synchronised so that the team can start working on the issues. As they log work and enter remaining effort, the manager pulls the actuals from JIRA and re-schedules the tasks, if required. PROBLEM: The team has always been using JIRA, but the company management wants to see reports in Microsoft Project. SOLUTION: The team leader extracts the necessary information from JIRA using Ceptah Bridge to prepare the reports. PROBLEM: A huge project portfolio stored in Project Server or Project Online needs to be kept in sync with issues in JIRA. SOLUTION: The IT team sets up an automated task that runs the Ceptah Bridge command-line tool on schedule to make sure that the changes made on each side are brought across. Task publication JIRA issues can be created based on the Microsoft Project tasks. Synchronisation Changes in both project tasks and JIRA issues can be synchronised in both directions at any time. Import from JIRA Existing issues, optionally including subtasks, can be imported from JIRA into an MS Project document. Events Customise the product even further by running your own VBA macros at different stages of synchronisation. Works with projects stored in any version of Microsoft Project Server, including Project Online (Project Pro desktop client is required). Supports custom enterprise fields in Microsoft Project Professional 2003-2016 (Microsoft Project Server 2003-2016). JIRA users import Existing JIRA users can be manually or automatically imported into Microsoft Project as resources. JIRA user and MS Project resource names can be different. Preview of changes Preview and confirm the changes the Bridge is about to make in your tasks and issues before applying them. If the connector is not going to act the way you would expect it to, the settings can be adjusted to ensure the desirable behaviour. Customisation Define the mappings between MS Project and JIRA fields that suit best your management process. The settings apply to publication (issue creation), synchronisation and import. JIRA Cloud 100% compatible with JIRA Cloud. The software does not need to be installed on the server. Resolved issues Review resolved issues submitted to you by your resources and close or reopen them. Command-line mode The import and synchronisation can be launched using a command line tool included in the software package. Software requirements JIRA: 3.13 and higher, including JIRA 7. Microsoft Office Project: 2000, 2002, 2003, 2007, 2010, 2013 and 2016. Microsoft Project Server (optional): 2003-2016. The rich set of mappings allows tailoring the product for the specific needs of each project or business process. The mappings define how particular issue fields, links and worklog entries are synchronised, including the direction of synchronisation. The settings can be saved in a file and imported into a new project or used to run the tool in a command-line mode. Depending on the business scenario, issues can be imported into Microsoft Project and/or MS Project tasks can be published in JIRA. Then the data can be synchronised as required. Ceptah Bridge shows a detailed preview of all the changes that it is going to make. You can even reverse the direction of synchronisation for a particular field on the spot if required (the Due Date is crossed out in the screenshot and the Finish field on the MS Project side is added instead). JIRA users can be imported into MS Project as resources and assigned to selected tasks. Ceptah Bridge retains the association between the original user and the new resource and uses it during subsequent issue synchronisation. Resolved issues submitted for review to the manager can be browsed and closed or reopened from Ceptah Bridge. Ceptah Bridge page on the Atlassian Marketplace. Our products are successfully used by a number of customers in different countries ranging from individuals and small businesses to high-profile international corporations.